"I would like to take this opportunity to thank you both again for giving up your time to contribute to the Discovery Group on the 24th May 2007. The children had an absolute ball and we really appreciated your help. We hope that you enjoyed it half as much as we did !!" 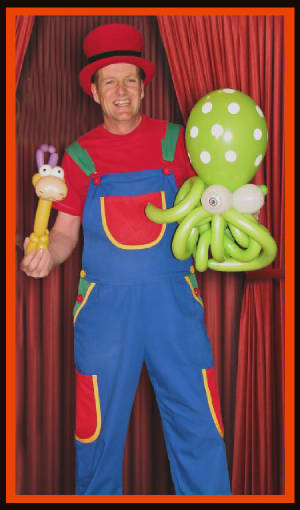 We have the perfect balloon modelers for your event. All our artists have many years experience. 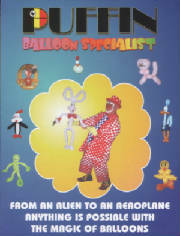 Their costumes and personalities are finely tuned so as to give a marvelous audible and visual addition to your event. Our artists have disclosure with public liability and a reputation for professional conduct. Qualatex balloons are a must-have for every balloon lover. Figures, like a Parrot in a Swing and a Motorcycle with a Kickstand, Butterflies to Mermaids. * If the sound of a balloon popping startles you, you're not alone. A bursting balloon actually creates a small sonic boom! Once a hole is made in an inflated balloon, the quick release of the balloon's energy, or air, causes the hole to grow at almost the speed of sound in rubber. Since this speed is much higher than the speed of sound in air, the hole in the balloon actually breaks the sound barrier, creating a sonic boom. * Balloons were invented in 1824, the same year as the electromagnet. * Pioneer manufactures nearly one billion Qualatex latex balloons per year. * Helium-filled balloons float because helium is lighter than nitrogen and oxygen, the two components of air. * For more than 80 years, Qualatex balloons have celebrated big events worldwide; from American political conventions to Korean television specials. * Qualatex latex balloons are made from 100% natural latex; not plastic. Qualatex latex balloons are biodegradable, and decompose as fast as an oak leaf in your backyard! *Latex balloons come from rubber trees. Latex is collected by cutting the trees bark, then catching the latex in a cup. Latex harvesting doesn't hurt the tree! * Latex balloons are Earth-friendly! Rubber trees grow in rain forests. Latex harvesting discourages deforestation because latex-producing trees are left intact. A tree can produce latex for up to 40 years!